The flag of Greece is rectangular with nine equal stripes of blue (5) and white (4) from left to right. In the top left corner is a blue square with a white cross. This flag has been used since 1822, when the young Greek state was fighting for its independence from the Ottoman Empire during the Greek War of Independence. The current flag of Greece was officially adopted during the First national assembly of the Greeks at Epidaurus in 1822, and the flag with the 9 stripes was adopted as a state and military ensign (a flag used only by the government and the military, and only on ships). 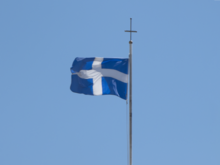 Another flag was chosen as a land flag, it was a simple white cross on a blue field. A third flag was adopted for the merchant fleet (a flag to be used by civilians on ships only), but it was only used for 8 years. In 1978, the ensign was chosen as the sole national flag, and it is now used by everyone on land and sea as the flag of Greece. It is sometimes known in Greece as the blue-white, in Greek Γαλανόλευκη (Galanólefki) or Κυανόλευκη (Kyanólefki). The current flag, used since 1822. The old flag, used between 1822 and 1978. State flag during the monarchy. National flag during the dictatorship (1970-1974). The first design for the Greek flag, 1797. This page was last changed on 28 August 2018, at 19:01.